February and March are not some of the favourites months for students. It is the exam stress that makes it impossible for them to concentrate on anything. For that matter, not just exam stress, it can be any stress that can hamper your daily routine. Stress at school for making it to the top list, stress at home with parents, stress at work, stress in relationships, financial stress, or any other type of stress can be disturbing for you. If we talk about exam stress, especially if we talk about board exams, which are crucial stepping stones to the future, students end up questions like will I make it to the top? Will I remember what I have studied? What if I fail? Some other problems that they deal with are sleepless night and concentration. Just after five minutes of opening their book, they start feeling sleepy. Though in past few years, a lot of counselling and support is available for exam stress. Even the Central Board of Secondary Education (CBSE) has a helpline, answering all queries of the students. 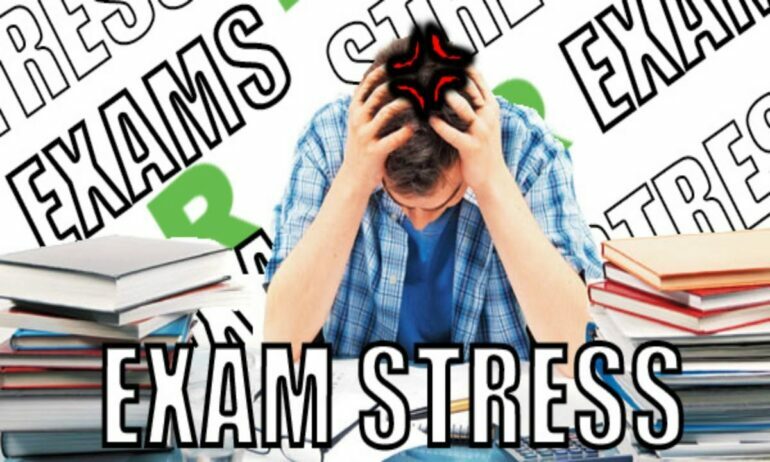 We have also listed some solutions for all those who are dealing with exam stress. It happens with many students, when they are studying, their mind wanders off to several places. According to Sudeshna Nath, a consulting psychologist, “Unless there’s a medical problem, we all have a span of attention. We need to understand for how long, and how many things can we attend to at one point of time.” One solution to this can be, do not sit for a long stretch of time. Take a break after every 40 minutes. Whenever you think you are not able to concentrate, just take a short break, walk around, drink a glass of water and then sit back for studies. Also, do not try to study everything at the same time. Take it one at a time. Anything that is not interesting for you can make you feel sleepy. If it is boring you and you still do it half-heartedly, there are chances you will feel sleepy. Another reason for feeling sleepy all the time is not getting enough sleep. At least six to eight hours of sleep at a stretch is necessary. One way to deal with a sleepy head is, sleep for minimum six hours at least. When you sit to study at the peak hours take up subjects that need more concentration and save the lighter ones for later. Has it ever happened to you that you read something four-five times and still do not remember a single word, but remember the lyrics of a song by heart, that you have heard only once? The simple logic is you learn the lyrics because you understand it and like it. So try implying the same logic for studies. If you try to mug up things without understanding it, there are chances you won’t remember anything. For memorising something it has to pass through three channels. Sensory memory, short-term memory and long-term memory. So whatever you have studied has to be revised in 24 hours to make it reach short-term memory. For the long-term, understand the concept, elaborate on the topic and the information will stay with you forever. Anxiety is something, if it goes beyond a limit, it can be destructive and sometimes would even need a professional help. While studying if you are thinking about results is the time when performance anxiety strikes. To avoid it, solve lots of question papers, analyse yourself and set realistic goals and not what others expect and only concentrate on studying not results. So, flush exam stress and enjoy your studies do not take it as a burden. All the best.